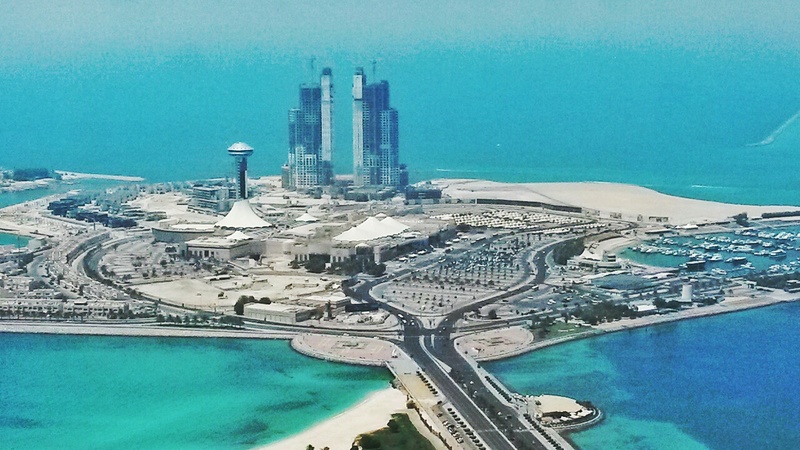 Four of the Best Attractions to visit in Abu Dhabi – Why Waste Annual Leave? 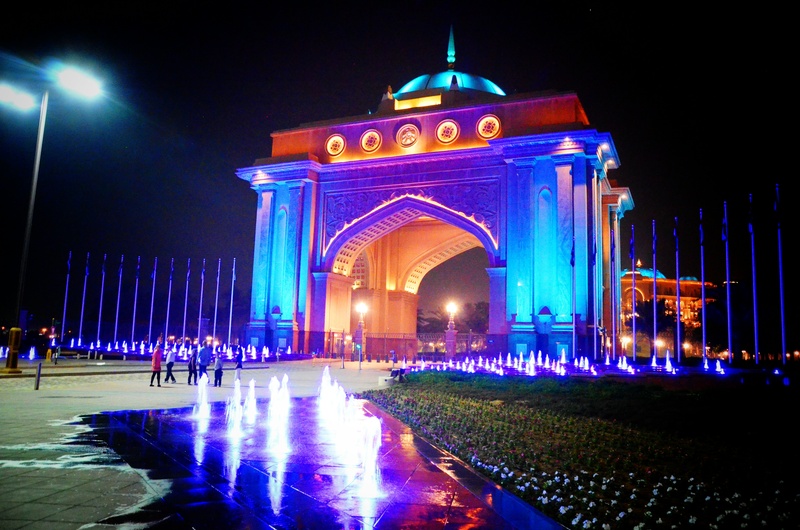 As far as a Middle Eastern tourist destination goes, Abu Dhabi is frequently overshadowed by its sister UAE province, Dubai, which has seen a huge surge in tourism over the last decade or so. Pumpkin and I happened upon a short break to Abu Dhabi when we booked an Etihad Airlines flight to the Seychelles and we had no intention of turning down a chance to explore a new country that was en route anyway. 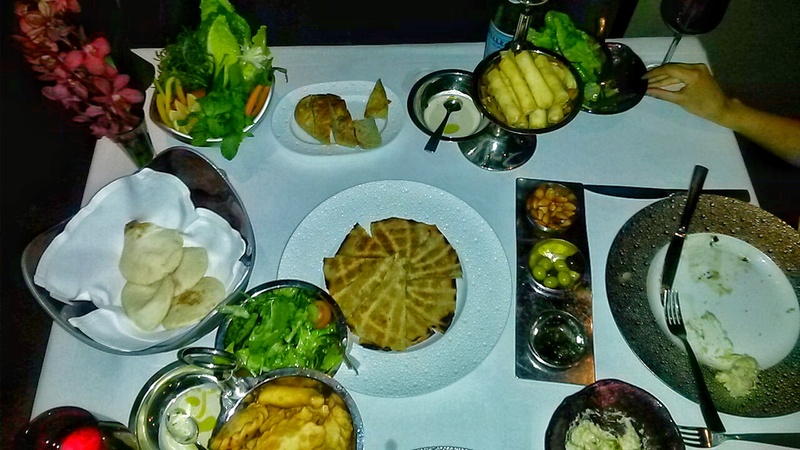 What can you do in Abu Dhabi apart from amusement parks and desert safaris? 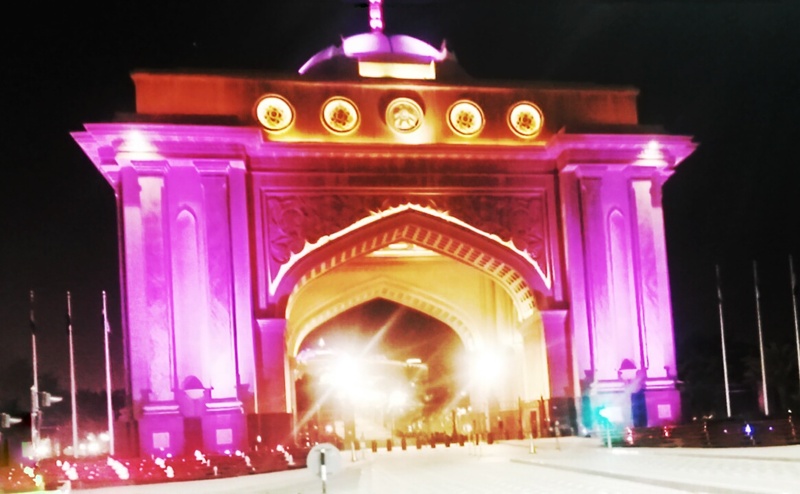 Usually when I choose a destination, I do so with the specific intention of experiencing certain sights but aside from the Grand Mosque, which I knew I wanted to see, I found myself pondering what on earth we would do during our time in Abu Dhabi. And that continued right up until we arrived there! My travel itineraries are increasingly becoming more spontaneous and unplanned and the unfamiliar malleability it affords is a feeling I am finding rather liberating. The Yas Marina Circuit and Yas Waterworld kept cropping up as places to visit, as did various shopping malls but Formula 1 excites me even less than shopping does and I couldn’t picture myself traipsing round a theme park during an Arab summer! And then there was some talk of dune bashing on a desert safari but given that I feel motion sick on flat roads in the UK, I figured that probably wouldn’t be sensible. At home, I usually overcome the nausea by being the one to drive on long journeys but if I attempted this on the sand dunes, I suspect neither one of us would have made it home. 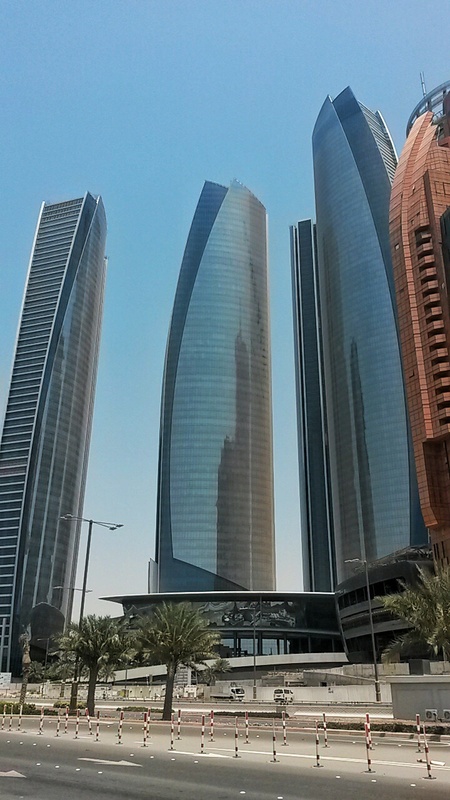 Jumeriah at Etihad Towers is one of the most architecturally impressive hotels in Abu Dhabi, its 3 peaking towers standing proudly, face to face with the Emirates Palace Hotel. Other than its own hotel guests, Jumeirah at Etihad Towers attracts tourists from all around Abu Dhabi, in part due to its array of glamorous bars and fine dining restaurants (I highly recommend Li Beirut for top notch Lebanese and Arab cuisine) but also because of the Observation Deck at 300, which boasts panoramic 360 degree views across Abu Dhabi. 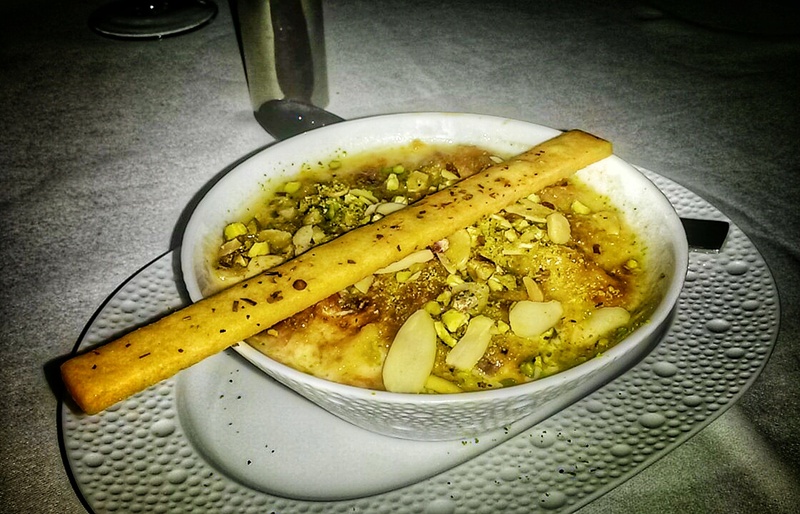 Umm Ali Dessert: A Middle Eastern Take on a Bread Pudding. 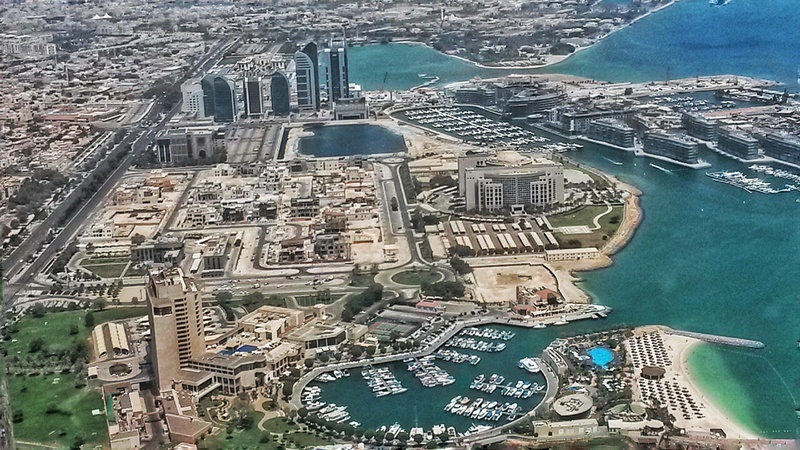 I have always found an aerial view to be an intriguing perspective to view a city but I arrived rather ambivalent about what to expect as on the ground level, walking around Abu Dhabi’s wide boulevards with fast cars and discrete sharp-edged buildings, I hadn’t yet warmed to the city aesthetically. And with an achy pop of the ears, we ascended the towers and the contrasting hues of barren terracotta landscapes being framed by the clean lines of the skyscrapers piercing the bluest of skies had me reconsidering my stance. However, ticket purchase comes with a coupon worth 50 AED, which is redeemable against any food or drink available there. Selections of food and drink include salads, sandwiches and some delicious patisserie style cakes, deluxe teas and coffees and a fabulous selection of mocktails. We visited on a Friday, which is a Holy day there and no alcohol was served. The city views are seen entirely through glass windows so there are no open decking areas to stand and take photographs from. There is no turnaround time on your visit and you are free to walk around the communal areas of the hotel. 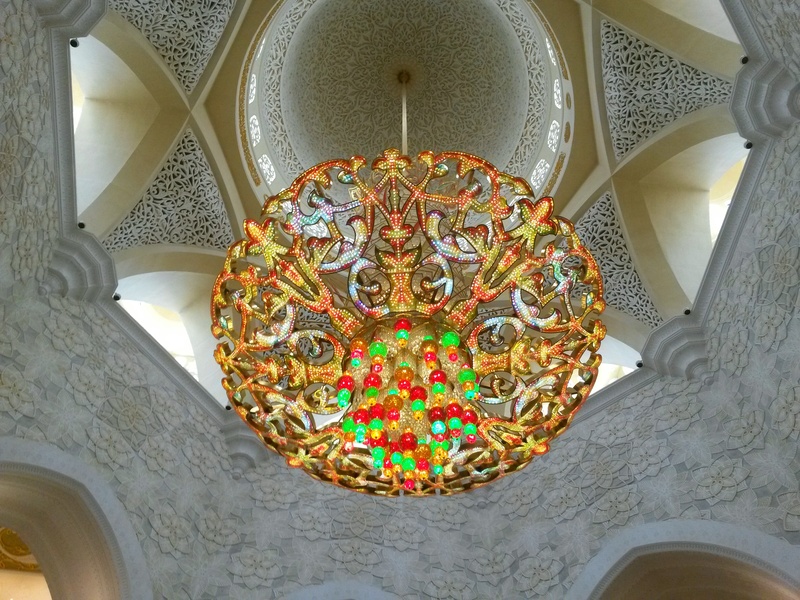 As with so many of the hotels in Abu Dhabi, the high ceilinged lobbies, glitzy chandeliers and regal furniture fit for royalty predominate the decor and have a certain pizzazz that impresses. There are tables and chairs for dining at the observation decks but those with the most prime seating at the periphery with the best views are usually reserved for guests who have made advanced booking for afternoon tea (which I must admit did look rather tempting but we had already planned to return just a few hours later for a feast at Li Beirut. 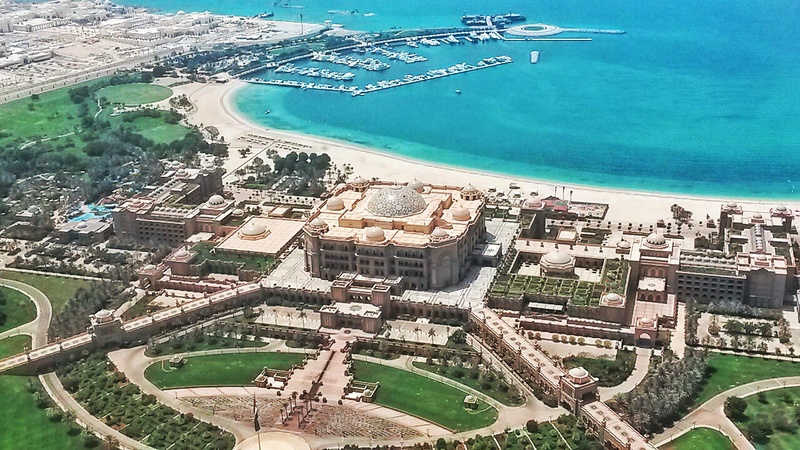 You would be forgiven for thinking Emirates Palace is a palace (the name hardly makes you question otherwise) but in truth, this is a world-renowned, glamorous hotel. It seems there is no admission to non hotel guests on Fridays and when we went, we were told this was the case both on Fridays and Saturdays. These rules apply even if you just want to wander around the grounds. Secondly, they have a very strict no-shorts policy for men, which isn’t always the easiest box to tick when the soaring temperatures have you perspiring from every pore! If you really want to browse the interiors of this hotel, I would therefore suggest going on a Sunday – Thursday and for men to go with full length trousers and proper shoes rather than flip-flops as many have been turned away on the grounds of attire. 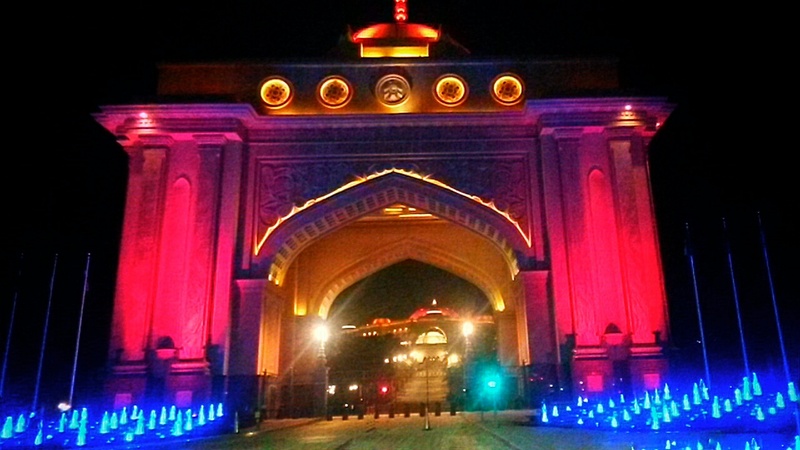 Undeterred by our inability to venture inside the grounds, we instead walked around the exterior of the Emirates palace later that night after dining at Jumeira Etiihad Towers, mesmerised by the revolving bold colours of the illuminated palace gate at night-time. 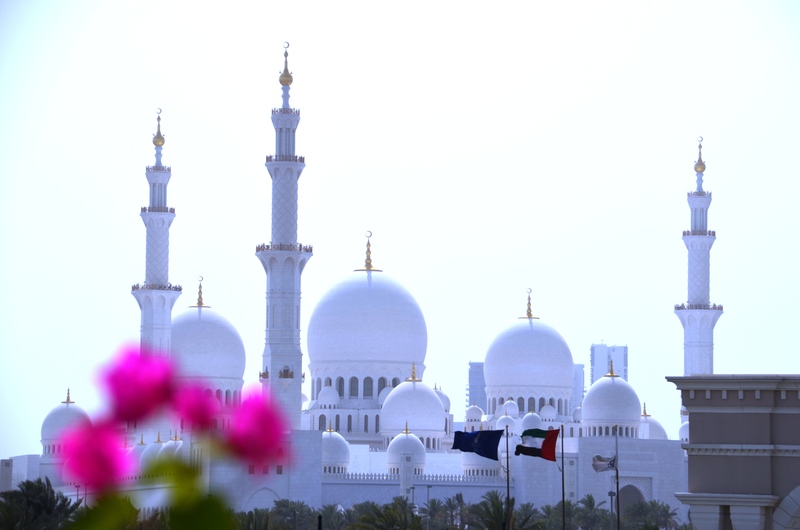 No trip to Abu Dhabi would be complete without a visit to the Sheikh Zayed Grand Mosque. If you only have time to explore one sight during your UAE break or if you are stopping by during a long layover, this is the one not to miss. The mosque is a truly stunning and opulent architectural masterpiece and is open to tourists daytimes and evenings except on Friday mornings. An attraction this spectacular is worthy of an article in its own right and I will soon feature another post, packed full of day and night photos of the mosque as well as plenty of useful tips to help you plan a visit here. In the interim though, here are a few teasers and at the very least, I would suggest checking about opening times and dress code before you visit. I personally love exploring religious monuments, so much so that a good friend of mine who accompanied me to Thailand almost exactly a decade ago, once uttered the phrase, “no more temples – please!” However, even if this isn’t your usual area of interest, this mosque is an astounding sight and we were fortunate that the shimmering night views of the mosque were visible from the lavish Ritz Carlton Grand Canal Hotel, which is ideally located for visiting this attraction. I must admit that we stumbled upon this bridge purely by chance whilst we were in a cab journey at night but were so taken by it that both Pumpkin and I wished we could somehow have stopped to photograph it. As it turned out, when we arrived at the Ritz Carlton, we found that the canal side part of the hotel happened to offer an ideal vantage point to see this bridge again after dark and off we went, armed with our cameras and phones. Despite our reservations about how we would fill our three night stay, we managed some lovely, slow-paced sightseeing whilst still having plenty of pool time, which frankly, is the only antidote to the soaring temperatures. Have you ever visited the UAE? What are your suggestions? That’s a lot of travel for a 3 day trip, did you not find it too much? I keep trying to push Justin to venture further on our long weekends so perhaps you could help me persuade him? lol. You are absolutely spot on with your description Suzanne – the Grand Mosque is SOO camera worthy – I cannot believe quite how many photos I took in just a couple of hours and it’s most unlike me to return to the same site twice in such a short trip but we couldn’t resist seeing it by day and night. Both were completely contrasting views but equally gorgeous! If you do ever make it, even just for a short stopover, this is definitely the one not to miss! Wow, the architecture is just beautiful. It must feel like a fairy tail at times! I had mixed opinions on the overall architecture of the place Katie but the Grand Mosque was completely undoubtedly gorgeous! We just couldn’t stop staring at it in awe of how stunning it was and I loved just how different it looked in daylight and after dark. Funny you say that Janice – I got really lost in both Venice and San Francisco too! Completely embraced it in San Francisco, especially given how friendly everyone was but I think we’d have enjoyed it more in Venice if the getting lost wasn’t happening after our evening meal in the dark! I’ve never actually been to Istanbul so I can’t compare personally but hubby has so I must ask him – didn’t even occur to me to speak to him about how he feels they compare and contrast. I’d love to see the Blue Mosque myself. 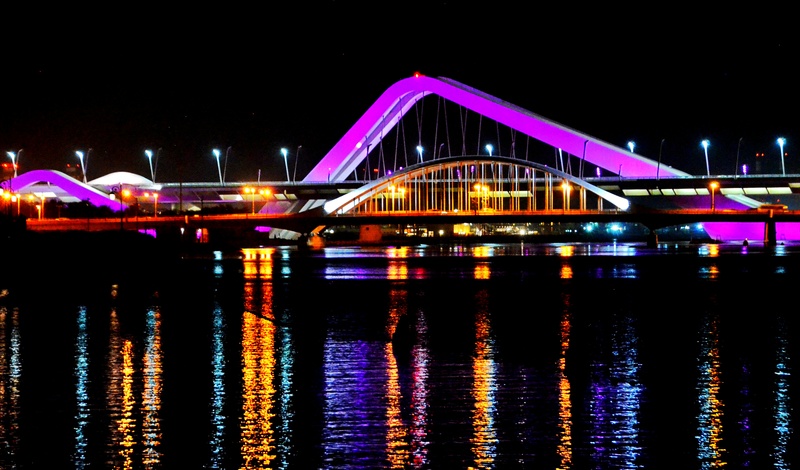 That bridge really does look impressive at night and I’d definitely have to try the desert safari if I was visiting. You should do Suze if you’re game! I just wasn’t sure my stomach would cope with the bumpy ride especially out in that heat but most of my friends who have tried it before have actually really enjoyed it! Definitely a place I’ve always been intrigued about! Great photos! Thanks so much Becky! It’s interesting to see how the tourist scene is emerging and growing in so many parts of the Middle East in the last couple of decades. Great selection here! 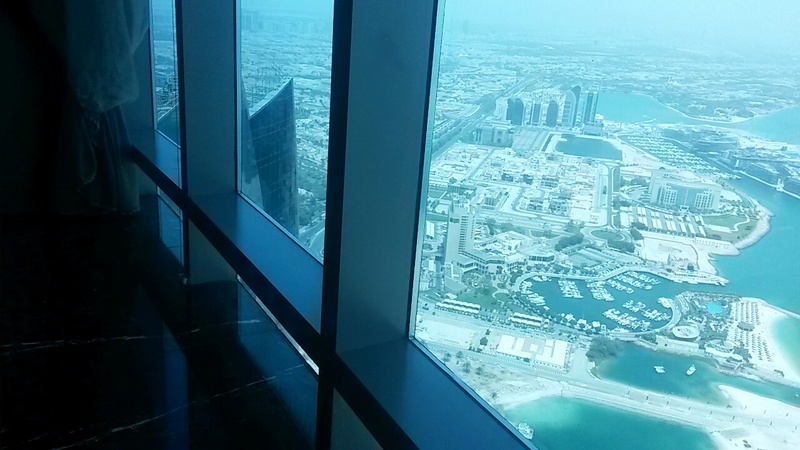 I didn’t know you could go to the top of the Etihad towers – great idea! Thanks Tim! I’m not sure if it’s the absolute top but it was pretty high that’s for sure and the views were lovely! Shame you can only see them through glass though at that height, I’m sure that’s completely sensible and safe! We have visited Dubai from Doha many times, but have never ventured to Abu Dhabi, because as you rightly say, it’s overshadowed a little! 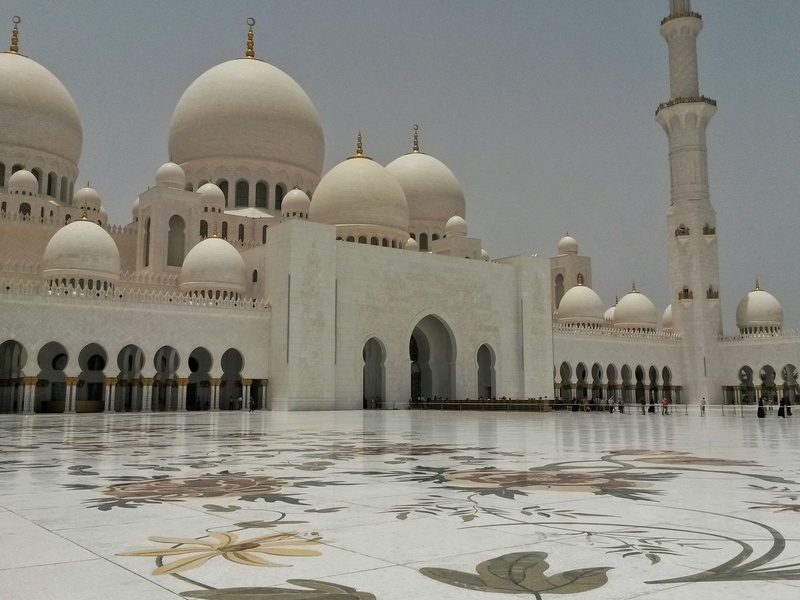 I am not a huge fan of the architectural style of the UAE either, but there are definitely a few tidbits here which could tempt us over – particularly the Grand Mosque. Your photos are lovely! thanks for sharing. I guess it greatly depends on who you fly with – Etihad or Emirates and if you want a stop over, as so much of the Emirates tourism comes from stop overs. in some ways it looks more appealing than Dubai, but without the water park! I regret not visiting a lot of things in Abu Dhabi. 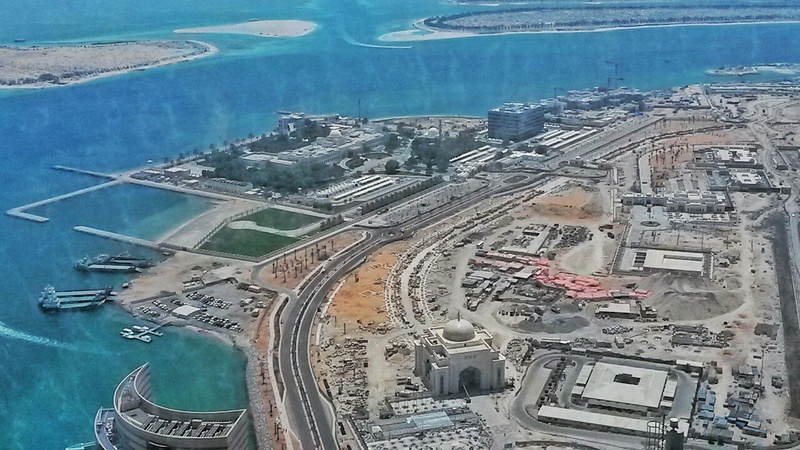 I was there for the Formula 1 Grand prix and spent most of my time at the Yas Island. The Burj al Arab works as the Emirates Palace, they don’t accept non-guests, unless you have a reservation in of their restaurants/bars. They don’t offer any tour, at least not the time I went there in 2013. The hotel looks amazing though! We’ve been looking at going to the Seychelles recently and trying to figure out a stopover, so I like hearing about how you dealt with the heat (and enjoyed it anyway)! I know July-August is very, very hot. 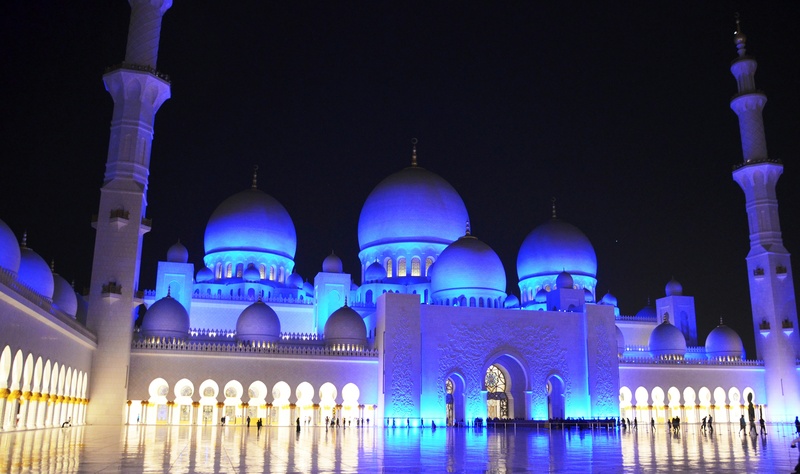 The architecture at the mosque, and the pictures at night, look unbelievably stunning. That, in combination with the aerial photos make Abu Dhabi look just a bit surreal and definitely unique. Gorgeous pictures Shikha! The aerial views look fantastic, and of course the photos of the Grand Mosque are very beautiful, and I’m waiting to see more. 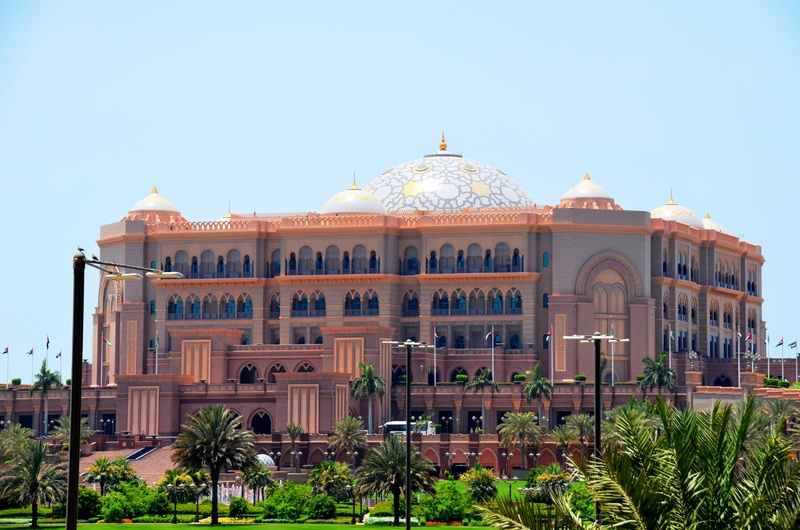 Too bad about the Emirates Palace though; it is extremely lavish inside and as you said, an attraction in itself. But I guess in a way it’s good to leave something out – gives you a reason to return 😉 Glad you got to explore the city at a relaxed pace. Great write-up! !